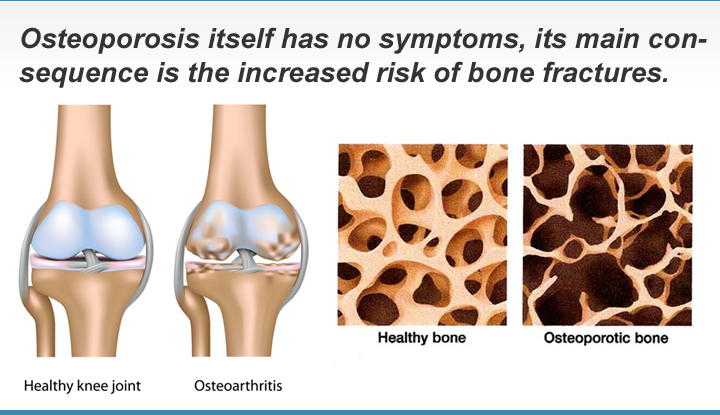 Osteoporosis is a disease in which bone becomes fragile and more likely to break. Bone is a complex living tissue that can heal and may be affected by poor diet and lack of exercise. As part of the natural aging process, bones begin to break down faster than new bone can be formed. Osteoporosis takes away the minerals that make up the internal supporting structures of bone until it becomes so weak and brittle that bending to pick up a newspaper, lifting a vacuum, or even coughing can cause a fracture. More Info: Learn how we screen for Osteoporosis.